Did the South London TSA break the law? If closing Lewisham A&E is illegal because considering Lewisham Hospital as part of the answer to SE London Health Authority’s financial problems was ultra-vires because they made recommendations that were not “in relation to the trust”, where the trust was South East London trust; will the Secrteary of State look to recover the fees of the Trust Special Administrator who made a recommendation later proven to be illegal. Hunt’s closure of Lewisham A&E ruled illegal by the High Court, and here’s how various supporters of the campaign reacted. Unfortunately, I can’t make the final consultation meeting organised to consult on the TSA report on South London’s Hospitals. It seems that a large number of Lewisham’s residents have managed it. We can find out what’s happening by tracking twitter’s #savelewishamae feed. 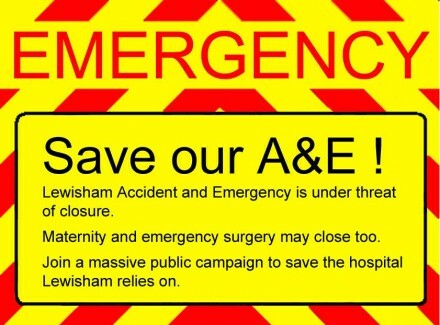 A special administrator has recommended that Lewisham Hospital’s A&E and Maternity wards are closed, seemingly to create demand for other local hospitals which are part of the financially failing South London Healthcare. A campaign has started to defend Lewisham Hospital, which explains why Lewisham Hospital is to be gutted while it is the outer London’s, South London Health Care Trust that is financially failing. Heidi Alexander, the local MP, states her support in an article, “Join the fight to save Lewisham A&E & maternity”, on her web site, she points at the campaign’s site, and advertises the “Hands around Lewisham Hospital event”, together with the consultation exercise meetings taking place in the area. If you live locally, you might like to take part in some of these. “Hands around Lewisham Hospital” is taking place on Saturday 24th November, it has been announced on the “Take Action” page of the “Save Lewisham Hospital campaign web site. It is planned to assemble at Loampit Vale roundabout at 2:00 p.m. and march to the Hospital and then link up around it. The Campaign is also encouraging people to write to the Special Administrator and tell him what you think. How to do that is explained on Heidi’s and the campaign’s web sites.